The following is a short, unpublished piece I wrote immediately following the earthquake that hit Haiti two years ago today. 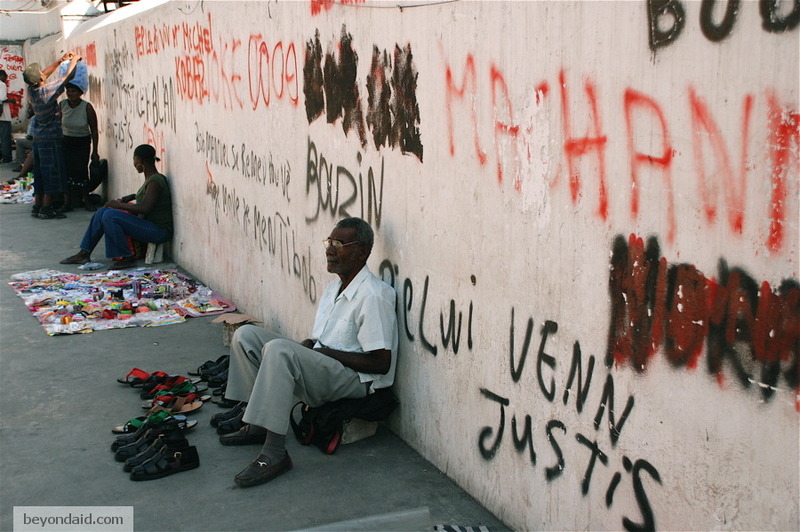 My theme is walls because of the physical nature of the tragedy, but Port-au-Prince consists as much of music and injustice, resilience and frustration, as of bricks and mortar. May it come back stronger and fairer than it was, and every bit as brilliant. When I first visited Haiti as a backpacking student eleven Boxing Days ago, my future wife and I arrived by bus after dark and went to bed without having seen the dimly lit capital. Lying awake in the sweltering, airless hotel room, I spent hours listening to the animals scurrying about and relaying their squeaked messages inside the walls that hugged the bed on three sides. When we awoke to a sunny Sunday morning and went out for a look around, the first thing I remember noticing was how vocal the walls outside were as well. A giant Wu-Tang symbol. “Aristide or death” scrawled in Creole. Layers of stories. Everywhere the walls talked. Pro-Aristide. Anti-Aristide. Pro-government. Anti-government. Moses. Che. Musicians. Gang leaders. Only Satan and the UN peacekeeping mission received universally bad reviews. The walls also kept people and secrets in. Those shopping or just passing through the heart of the city could forget that the national penitentiary’s blue-and-white walls concealed nearly 4,000 men in a space the UN deemed fit for 438. Inside the cells, rough drawings of women, guns and musical instruments did little to distract from the overcrowding and squalor. In the corridors, the walls displayed officially sanctioned murals and slogans. At the entrance of a three-storey ship-like structure out of whose many barred windows dangled the legs of those lacking the seniority for a mattress, “Welcome to Titanic” was splashed in bold red, green and black. Roro Pascal, the gentle-eyed 26 year-old prison artist, told me UN forces had arrested him four years earlier and he was still waiting to see a judge. “What did they bust you for,” I asked. “Murder,” he said and he smiled sheepishly. The morning after the rains started up, a radio newscaster announced the storm had brought down a cemetery wall, killing a young girl. Then, a few months after I left, the walls suddenly stopped telling stories and they tried to kill their city. This entry was posted in Stories from the Field and tagged earthquake, Haiti, Port-au-Prince by Beyond Aid. Bookmark the permalink.